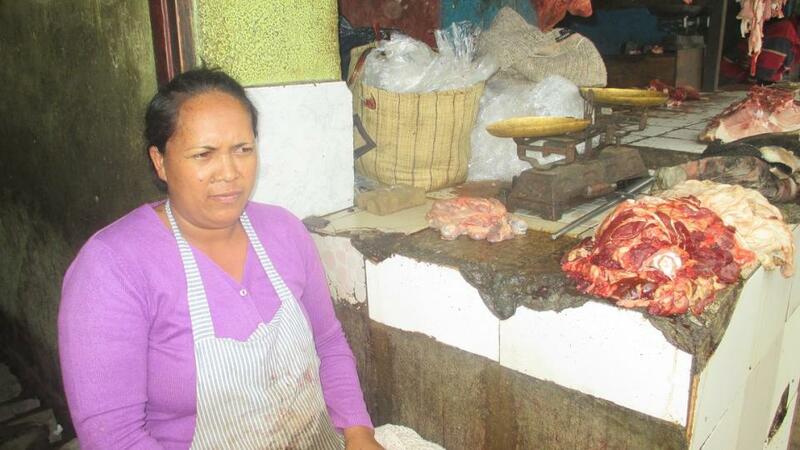 A loan of $175 helped to buy 70 kilos of tripe. Julie is 36 years old and married to a bus driver. The couple has four children together, all of whom are at school. Julie sells tripe and began this activity in 2012. Tripe is the type of meat that is most requested by customers in view of its price. The amount of tripe she has on offer is low in relation to customer demand, and for this reason she is requesting a new loan to increase her supply. Her desire is to build up a solid working capital so that she can become financially autonomous in her activity. Translated from French by Kiva volunteer Alison Le Bras. View original language description. Julie a 36 ans, elle est mariée avec un chauffeur de bus. Ensemble, le couple a 4 enfants, tous scolarisés. Julie vend des triperies. Elle a commencé cette activité en 2012. Les triperies sont les types de viande les plus demandés par les clients en raison de leur prix. La quantité de triperies offerte est encore faible devant la demande des clients d’où cette nouvelle demande de prêt pour augmenter la quantité. Son souhait est de constituer un solide fonds de roulement afin d'être autonome financièrement dans l'activité. It supports entrepreneurs in Madagascar with a full suite of financial services. CEFOR is a socially-oriented MFI that targets people who have not accessed credit in the past. The organization operates 11 branches in and around Antananarivo, the capital and largest city in Madagascar. CEFOR offers loans to low-income entrepreneurs. CEFOR's non-financial services include health insurance, trainings, and at-home coaching delivered by designated training officers. In addition to its microcredit program, CEFOR runs a vocational training program with the goal of helping young people enter the job market. Kiva shares CEFOR's commitment to providing economic opportunities to communities without access to traditional bank loans. Kiva also supports CEFOR's efforts to provide health and training services to clients. Kiva funding allows CEFOR to provide loans and enterprise management training to individuals living under the poverty line in the urban area of Antananarivo, Madagascar.